This reconditioned Advance PBU series propane-powered burnishers are loaded with performance features to make your floors shine in less time. The PBU series provides the fastest high-gloss burnishing available. 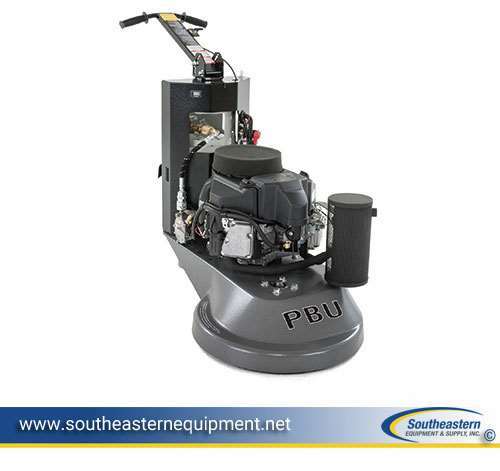 The Advance PBU 21 has a 21 inch (53 cm) pad size and can burnish up to 25,000 square feet (2,322 m2) per hour, while the PBU 27 model offers a larger 27 inch (68 cm) pad capable of burnishing up to 33,000 square feet (3,066 m2) per hour. Simple controls ensure your operators won't be slowed down with machine adjustments just start it and go. Agency Approvals EPA & C.A.R.B. New Aztec Sidewinder 24" Propane Stripper Demo Tennant B7 27" Battery Floor Burnisher Reconditioned Advance Whirlamatic UHSB20 Battery Burnisher Reconditioned Advance Advolution 20BT Battery Burnisher 20"